I've been going to the Tribeca Film Festival for a couple of years now and one of the strongest parts of the festival has been the documentaries. Each year I manage to see a couple that I can't get out of my head. 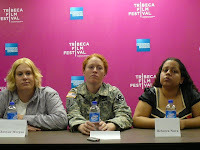 This year one of the films was Lioness, a film about women soldiers on the front lines in the war in Iraq. Yes, women soldiers are on the front lines in Iraq. Just like the farce of Don't Ask, Don't Tell, the policy that prohibits women in combat does not reflect the reality of this war. Team Lioness was created out of necessity on the ground in Iraq in 2003 to diffuse tensions with women civilians and children during raids and operations where soldiers were on the hunt for insurgents.